Banners urging University action in commemoration of the Bursar’s Office Takeover hang outside the Multicultural Center. In May, students released a list of 47 demands for improvement in black student experiences, departmentalization efforts and the campus dining transition. Students released a list of 47 demands Thursday — the 50th anniversary of the Bursar’s Office Takeover — urging the University to improve campus culture for black students, departmentalize the Asian American Studies and Latina and Latino Studies programs, and provide a smooth transition for food service workers. The list, organized by Black Lives Matter NU, the Latinx Asian American Collective and Students Organizing for Labor Rights, said the students want administrators to “clearly and definitively” indicate within two weeks whether they will fulfill the requests. University spokesman Al Cubbage told The Daily in a statement that administrators will continue to meet with students and alumni to further understand their points of view and work together. Black Lives Matter NU called for the University to increase representation and resources for students, faculty and staff as well as acknowledge the history of student activism involved in the evolution of black student experiences at NU. Among the group’s list of 36 demands were ones urging the University to fully acknowledge its oppositional role throughout aspects of the Bursar’s Office Takeover. 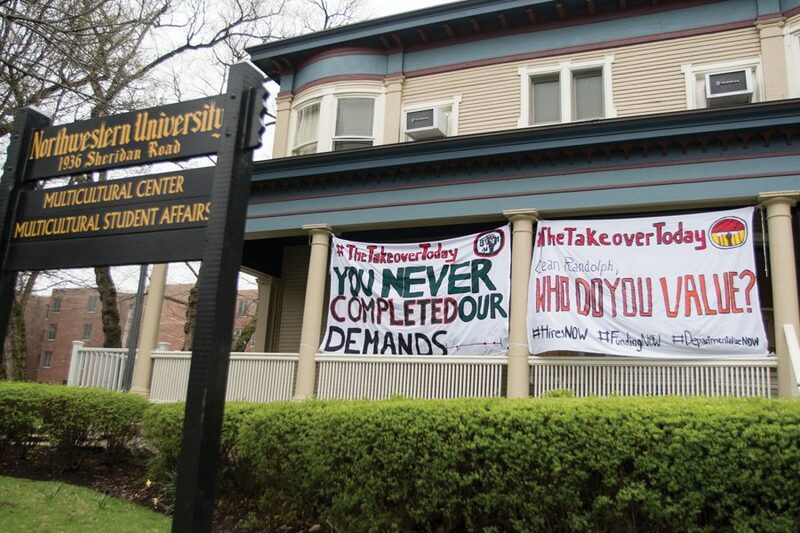 Many students and alumni said not enough has changed over the years, expressing concern with the parallels between the demands presented to administrators in 1968 and those developed after the disruption of a groundbreaking ceremony for the lakeside athletic complex three years ago. And Thursday’s list brought up many of the same issues as the 2015 protest. 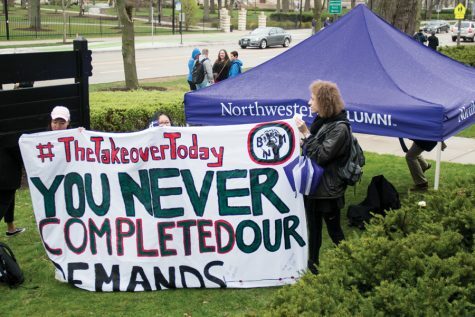 “These demands reiterate the concerns raised in 2015 by Black Northwestern students addressing this institution’s continuous failure to listen to Black students, internalize what they have to say, and act on their recommendations,” the list stated. Student activists hold a banner in front of the Multicultural Center. Students said they want administrators to “clearly and definitively” indicate within two weeks whether they will fulfill the requests. Last year, NU established steering committees based on the Black Student Experience Task Force Report’s 14 recommendations. Although three were prioritized for the 2017-18 academic year, associate provost and chief diversity officer Jabbar Bennett told The Daily in April that the University is “already making progress” on the rest. Still, not all of Thursday’s demands harkened back to the disruption of the groundbreaking ceremony. For example, BLM NU urged the University to offer departmental status to a number of current programs — including Gender and Sexuality Studies — by the 2019-20 academic year at the latest. The group also touched on the Housing Master Plan, addressing the importance of a clear plan regarding building accessibility, as well as cultural competency and privilege training for faculty, staff, administrators and University Police. Overall, students addressed a desire for greater transparency and accountability by the University in improving marginalized students’ experiences on campus, and called for monthly progress updates to students and faculty. 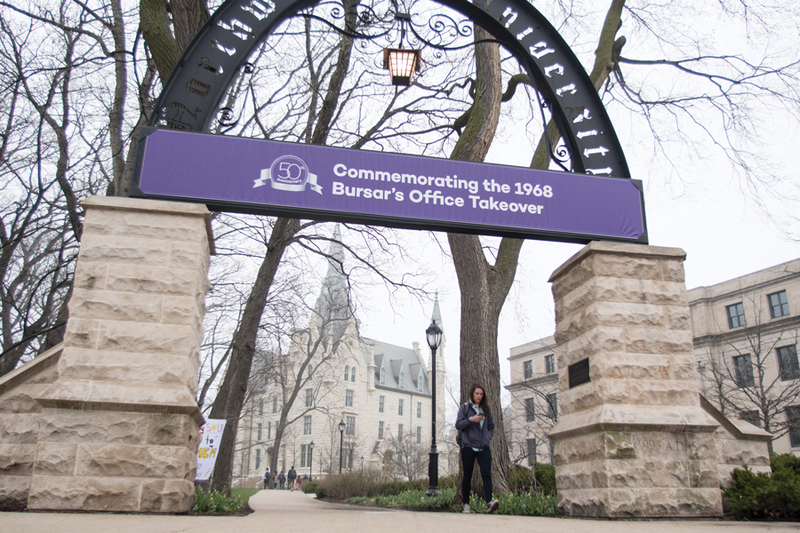 “They must focus on the tangible results of measurable actions to repair the University’s relationship to the Black community on campus and the wider Evanston and Chicagoland area,” the list stated. The Latinx Asian American Collective, a joint effort by the Asian Pacific American Coalition and MEChA de Northwestern, insisted the University create an Asian American Studies Department and a Latinx Studies Department. Students and faculty have said that without departmental status, the programs lack adequate funding to conduct research and hire tenure-track faculty, which limits the availability of courses and forces professors, as well as the program directors, to split time with other departments. The departmentalization effort began last fall, when students initiated meetings with faculty members to identify what was lacking in the programs. Soon after, the group began a social media campaign and finalized a proposal petition. Weinberg sophomore June Choe said in April that the movement had gained widespread approval from students, receiving more than 1,000 petition signatures and statements of support from more than 30 student groups. And although the program directors have also stood behind departmentalization efforts, as demonstrated in a February letter to the editor, Weinberg Dean Adrian Randolph has said faculty members are not all on the same page. Later in the day, Randolph told The Daily in an email that the University has not ruled out offering tenure to faculty members who are not in recognized departments. He also pointed to the foundation of the Center for Native American and Indigenous Research, which he said he feels “passionately” about. Randolph added that he sent the email to explain himself to students. A sign hangs from The Arch. University spokesman Al Cubbage said administrators will continue to meet with students and alumni to further understand their points of view and work together. Students Organizing for Labor Rights demanded that in the dining transition process, both Compass Group North America and Northwestern stop using the service E-Verify — which checks if employees are eligible to work in the U.S. — for current campus service workers. The group also demanded that Sodexo and Aramark, NU’s current food service providers, transfer all I-9 forms for campus service workers to Compass. They also urged Compass to not perform background checks on current employees and create and maintain hiring programs to employ workers with disabilities. Northwestern announced on April 13 that it would move from Aramark and Sodexo to Compass in the fall. University spokesman Jon Yates told The Daily in an April email that Compass will ask all current workers to join the company with the same pay, benefits and seniority, though he did not specify whether that is a requirement in the company’s contract with NU. Since NU announced the change, students and food service workers have expressed concern about the transition process. On April 20, about 70 workers gathered in Norris University Center and later marched to Sargent Hall to present a petition to a Sodexo official asking for support during the transition process. Elizabeth Arreguin, a Sodexo employee in Allison Hall, said at the march that she and many of her co-workers didn’t want to leave their dining halls.